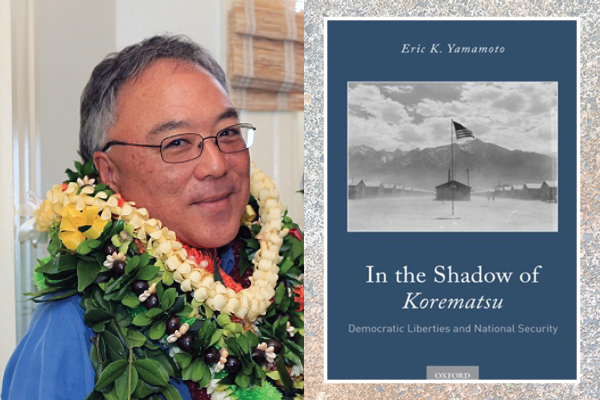 Please join us for a Talk Story with Professor Eric Yamamoto about “Democratic Liberties and National Security” and his new book published by Oxford Press, In the Shadow of Korematsu. We look forward to seeing you there. Please RSVP to jaclhon@gmail.com by Thursday, June 14. 2018, so we can make a headcount for food and beverages. The Japanese American Citizens League – Honolulu Chapter (JACL-Honolulu) joined the Fred T. Korematsu Center for Law and Equality (Korematsu Center) and others in filing an amicus brief on March 10, 2017, in State of Hawaii and Ismail Elshikh v. Trump et al., pending in the U.S. District Court for the District of Hawaii. The brief supports a legal challenge to the Trump Administration’s Executive Order 13780 (March 6, 2017), entitled “Protecting the Nation from Foreign Terrorist Entry into the United States,” which replaces Executive Order 13769 (January 27, 2017), of the same title. The challengers allege that the Executive Order violates the First and Fifth Amendments, the Immigration and Nationality Act, the Religious Freedom and Restoration Act, and the Administrative Procedure Act. In their amicus brief, the Korematsu Center and joining amici assert that courts can and should review executive branch action on immigration. The “plenary power doctrine”—arguably conferring a blank check to the executive branch—is based on a string of overtly racist and outdated cases. During World War II, the federal government used arguments similar to those it has submitted in opposing the State of Hawaii’s challenge. In accepting those arguments then, the Court acquiesced to the incarceration of Japanese Americans by executive order. Those arguments should have been rejected then and they should be rejected now—the 9th Circuit and the District Court for the Eastern District of Virginia have already rejected them in their review of the previous Executive Order. “The JACL-Honolulu has a proud history of standing up to those who misuse their power to discriminate against groups based on ethnicity or religion. Seventy-five years ago another administration tragically instituted Executive Order 9066, which led to the wrongful incarceration of thousands of American citizens. We must not let prejudice and racism enter the sphere of public policy again. We oppose the current administration’s discriminatory executive orders and we stand strong with our community,” said Alison Kunishige, JACL-Honolulu president. Hawaii counsel includes Louise Ing and Claire Wong Black of Alston Hunt Floyd & Ing, as well as Eric Yamamoto of the University of Hawaii Manoa William S. Richardson School of Law. Oral arguments in the State of Hawaii case are scheduled for March 15, 2017, at 9:30 a.m. Hawaii time. For further information, please email jaclhon@gmail.com. Today marks 75 years since the signing of Executive Order 9066, the executive order issued by President Franklin D. Roosevelt that cleared the way for the internment of American citizens of Japanese ancestry in internment camps. 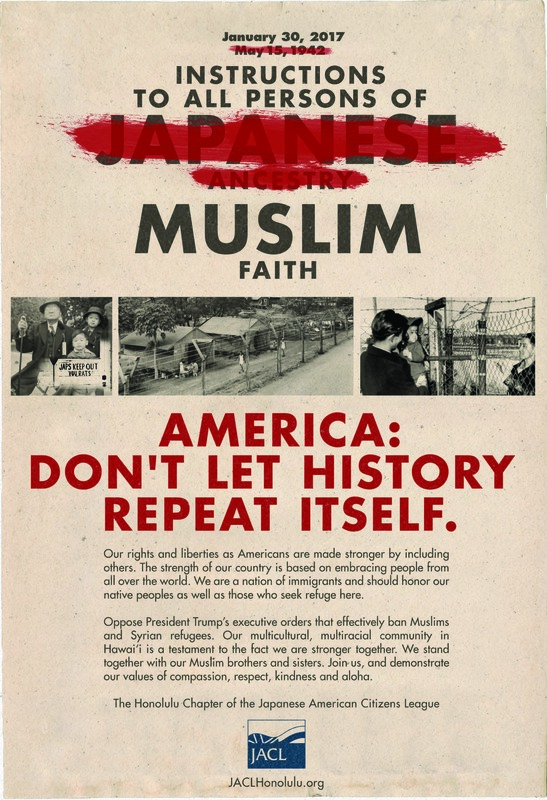 JACL Honolulu placed this advertisment in this weekend’s special edition of the Hawaii Herald as a call to not let this dark chapter of our nation’s history repeat itself. This year marks the 75th anniversary of President Franklin D. Roosevelt’s Executive Order 9066 (EO 9066) issued during World War II that cleared the way for the internment of Japanese-, German- and Italian-Americans to camps across the country. In 1944, Fred Korematsu challenged the constitutionality of EO 9066 and his incarceration in the historic Supreme Court case Korematsu v. United States and lost. To this day, while Mr. Korematsu’s original conviction was overturned the Korematsu decision still stands. 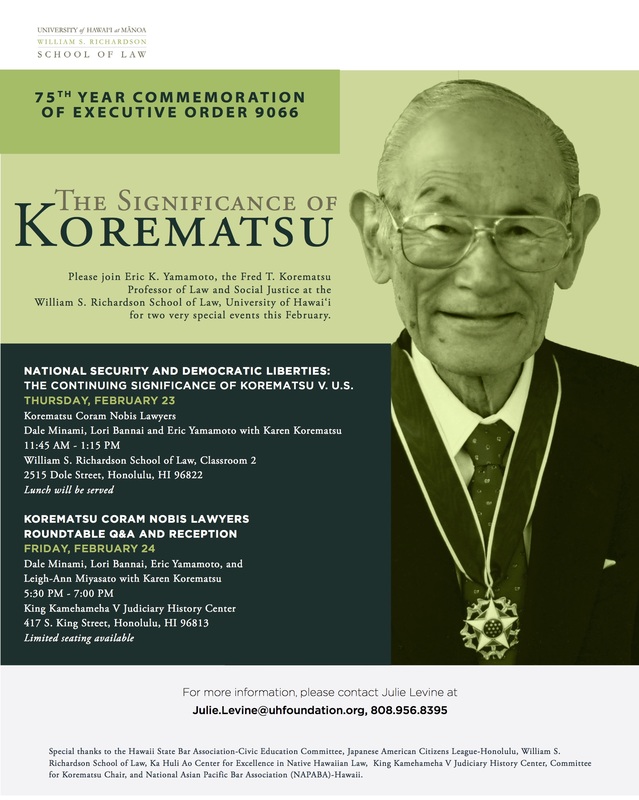 The first, on Thursday, February 23rd at the William S. Richardson School of Law, is a forum featuring presentations by Korematsu coram nobis legal team members Dale Minami, Lori Bannai and Eric Yamamoto, with Karen Korematsu and Richardson Scholar Advocate law students Anna Jang and Jaime Tokioka. The second, on Friday, February 24th downtown at the Judicial History Center, is a reception and roundtable Q&A with the same panelists, plus coram nobis team member Leigh-Ann Miyasato. Both events are open to the public and have limited seating. For more information, please contact Julie Levine of UH Foundation at julie.levine@uhfoundation.org or (808) 956-8395. Download a PDF of the event flyer. We, the undersigned Hawaii-based organizations, join the Muslim Association of Hawaii to oppose and reject the recent anti-immigration executive orders issued by President Donald Trump. There is no place in Hawaii and our nation for racist, discriminatory and ill-advised national policies as put forth by the Trump Administration. These orders, that (1) halt refugee admissions from all countries for at least 120 days, (2) indefinitely halt the admission of Syrian refugees, (3) lower the number of refugee admissions to the United States, (4) directs Department of Homeland Security to determine the extent to which state and local jurisdictions may have greater involvement in determining the placement or resettlement of refugees in their jurisdictions, and (5) suspend all entry of individuals from certain Muslim-majority countries are based on the misguided idea that certain religious and ethnic populations are more prone to violence and are incompatible with American values. The Trump Administration’s executive orders are an un-American and mean spirited ban on Muslims, issued under the guise of protecting our country. This is not the first time we have seen national security used as the basis to discriminate against ethnic minorities. Executive Order 9066, issued in 1942 during World War II, resulted in the unlawful internment of over 120,000 Americans of Japanese ancestry based solely on their race. Like Executive Order 9066, these orders will not make our communities safer or our nation stronger, and in fact undermine our standing in the world community as an enduring symbol of freedom and democracy. Our communities have experienced exclusion by law from the 1800s through the 1960s — with bans on country admission like the Chinese Exclusion Act of 1882 and the Immigration Act of 1924. Our communities, especially our Arab, Muslim, Sikh, and South Asian communities were viewed with suspicion and hate, and subjected to violence in the aftermath of the September 11 attacks. Our rights and liberties as Americans are not made stronger by excluding others. Rather, the strength of our local communities and our nation is based on embracing people from all over the world. We are a state and a nation of immigrants that should honor our native peoples as well as those who seek refuge here. Refugees, like other immigrants, enrich our communities and contribute significantly to American society. We oppose efforts to reduce the number of refugees entering the United States and recognize the hope that the United States represents to those in humanitarian crises. Refugees encounter a high level of scrutiny and security screening before arriving in the United States, often taking almost two years. Those refugees who are admitted for resettlement are usually the most helpless and vulnerable and have fled violence or persecution. We stand together as partners in peace and justice with our Muslim brothers and sisters here in Hawaii, throughout the U.S., and abroad in opposing the Executive Orders put forth. We stand together to support the rights of immigrants and refugees and will oppose further policies that rely on exclusion based on religion and ethnicity. Our multi-cultural, multi-racial community in Hawaii is a testament to the fact that we are stronger together as inclusive, diverse, respectful, peaceful communities and we call upon other organizations, communities, and individuals to stand together with us, demonstrating our spiritual values of compassion, respect, kindness, and aloha. HONOLULU, HAWAII – The Honolulu Chapter of the Japanese American Citizens League (JACL), the nation’s oldest and largest Asian American civil rights organization dedicated to addressing social and racial injustice and inequality, passed a resolution during their 2015 annual membership meeting on Nov. 21, affirming and supporting federal and local efforts to fairly and safely allow refugees to enter the state and country who face religious and political persecution in their country or state of origin. ON OR BEFORE October 17, 2014. Eligibility Requirements: Applicant must be a student who will be enrolled full-time in college-level or graduate level courses during the 2014-15 school year. Award: Award of $1,000. A single award will be given to the applicant that best demonstrates a commitment to civil rights.